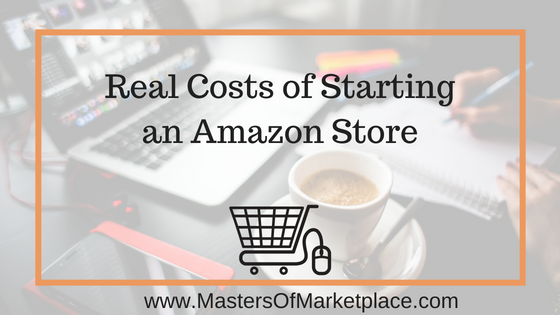 If you’ve ever considered selling products on Amazon, then I’m sure you (like most other business owners and entrepreneurs in the online space) have wondered about the real startup costs involved with starting an Amazon store. So what does it actually cost to start an Amazon store? And what exactly do you need to get there? So, I wanted to break everything down for you, explain Amazon’s fee structure, and give you an idea of how much money you actually need to get started selling on Amazon. It’s less than you think! The first factor to consider is what you plan on selling in your Amazon store. sell products under your own brand name that you source wholesale or have items custom made by a manufacturer. If you’re a business owner selling your own products, perhaps you sell books, t-shirts, mugs, or something else to complement your existing business, then Amazon could be an amazing platform to help you grow your business. If retail arbitrage sounds interesting, now is a great time to try it out. Many large retail stores have recently closed, which gives you a great opportunity to find good deals and resell for a profit on Amazon. Once you have an idea of what you want to sell, the next step is to sign up for your Professional Seller account, which will cost you $40/month. You do have the option of signing up for an Individual Seller account, which does not charge a monthly fee; however, Amazon then charges you $1 per sale on top of the regular percentage they take per sale. Ultimately, if you choose the individual account option, I’d still recommend upgrading to your professional seller account at some point in your Amazon selling career because it allows for more sales volume, which is everyone’s ultimate goal. In addition to the $40/month seller account fee, Amazon also takes 15% of each sale. So, for example, if you’re selling something for $10, Amazon will get $1.50 of that sale. Since Amazon is constantly changing their terms and requirements, there are certain product categories that are charged slightly more than 15% and some categories that are charged a bit less; but 15% is the average. Lastly, you’ll need to account for any shipping and handling charges along with your initial product costs. To access the spreadsheet with all these costs I’ve just listed broken down, click here. It doesn’t have to cost you $10,000 or $50,000 or even $100,00 to start your own Amazon store. You can typically get your first store up and running for between $500 and $1000. That’s nothing compared to what you’d pay to set up a brick and mortar retail shop. You’re talking $1,000’s in rent, hiring and training employees, purchasing all your inventory up front – the amount you can save is HUGE. Plus you’re getting your products in front of millions of customers on the biggest online marketplace in the world! Since Amazon does not have any minimum inventory requirements, all you need are a few items to get started. You can sell 10 of something, 100 of something, or even just one of something to test the market and build from there. Whether you have your own products or you want to start with reselling existing products, I highly encourage you to start online first. It’s going to cost you less than $500 to get started. Selling on Amazon is an amazing, low-risk opportunity for any entrepreneur who wants to test the waters and see how it all works. If you choose to buy products on clearance and resell them on Amazon, you might choose to then roll those profits into creating your own product to sell on Amazon under your own brand. If you already have your own product line, that’s great! You’re ahead of the curve and can start selling on Amazon today. Sign up for a professional seller account, create your product listings, let Amazon know how much inventory you have available and you’re all set to start making sales! There are 4 simple items you need to make it work. Click here to find out exactly what those are.